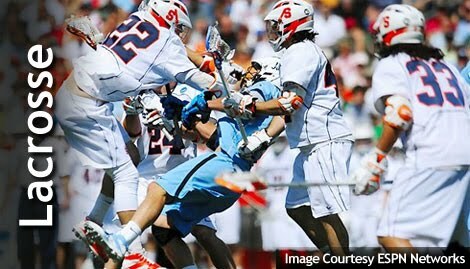 With the population of lacrosse growing, the ESPN Networks will be increasing the number of regular season games aired by 40% (from 30 to 42), and will be televising 15 NCAA Tournament games. The best part of these broadcasts? No Big Ten, SEC, or PAC 10 trying to take the spotlight and the money. Here is the press release and schedule put out by ESPN. ESPNU will lead ESPN’s college lacrosse coverage with increased game coverage this season, including 40 men’s and women’s regular-season contests combined, in addition to one live ESPN2 and ESPN360.com game. The networks will televise 57 games overall, including 42 regular-season contests (up from 30) and 15 NCAA Tournament games across ESPNU, ESPN, ESPN2 and ESPN360.com. Coverage will begin on ESPNU on Friday, Feb. 19, at 5 p.m. ET, when No. 6 Johns Hopkins hosts Manhattan. ESPNU highlights include the Konica Minolta Face-Off Classic, which will showcase No. 1 Duke vs. No. 7 Maryland at 11 a.m. and No. 8 Princeton vs. No. 6 Johns Hopkins on Saturday, March 6, at 1:30 p.m. at M&T Bank Stadium in Baltimore. The schedule will also feature the second annual Konica Minolta Big City Classic on Saturday, April 10, with No. 4 North Carolina vs. No. 3 Virginia at 4 p.m. and No. 2 Syracuse vs. No. 8 Princeton at 6:30 p.m. from New Meadowlands Stadium in East Rutherford, N.J. Included in this year’s schedule will be a new lacrosse doubleheader, the ESPNU Warrior Lacrosse Invitational, organized by ESPN Regional Television. The event will take place at Rentschler Field in Hartford, Conn., on Saturday, April 24, and will showcase No. 18 Massachusetts vs. No. 13 Georgetown at 11 a.m., followed by No. 17 Denver vs. Fairfield at 1:30 p.m. The men’s schedule will be highlighted by appearances from 19 of the top 25 teams ranked in the Inside Lacrosse’s Face-Off Yearbook Top 25. Also, defending NCAA Champion Syracuse, ranked No. 2, will make six appearances on air, along with No. 3 Virginia. No. 1 Duke will appear four times. ESPNU will also feature two women’s matchups: Towson at Johns Hopkins on Wednesday, March 10, at 4 p.m. and Ohio State at Johns Hopkins on Sunday, May 2, at noon. For the fourth year in a row, the ESPN networks will televise the complete NCAA Division I Men’s Lacrosse Championship. ESPNU will televise all eight First Round games and Quarterfinal contests May 15-23. ESPN2 will televise the National Semifinals on May 29 and ESPN will offer the National Championship game on May 31 from M&T Bank Stadium. ESPN360.com will simulcast the National Semifinals and Championship games. Quarterfinal # 1 – Princeton, N.J.
Quarterfinal #2 – Princeton, N.J.
Quarterfinal #3 – Stony Brook, N.Y.
Quarterfinal #4 – Stony Brook, N.Y.